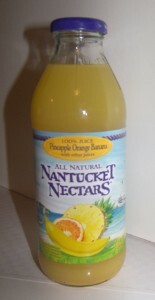 This past week, I found Nantucket Nectars on sale for 4 for $5 at Busch’s in Saline, Michigan. I bought several flavors to try out. The first one I am going to review is the Pineapple Orange Banana. This flavor is 100% juice with the breakdown being in order of great amount: grape, apple, pineapple, orange concentrates, banana puree, and banana concentrate. There is no added sugar, color, or preservatives. So I can pronounce every ingredient listed on the side of the bottle and that is a good thing! This is the best Pineapple Orange Banana juice drink I have ever had. A lot of those drinks are overpowered by the banana (like the Dole brand) but this one has the perfect balance of all three of the juices in the name. It’s not overly sweet either. My wife said she liked that you eat a bite of Cheerios with brown sugar on them and then take a drink of juice and have no funny tastes in your mouth. The apple and grape juice included I cannot detect with my tongue, unlike with many Juicy Juice flavors where those juices are obvious.